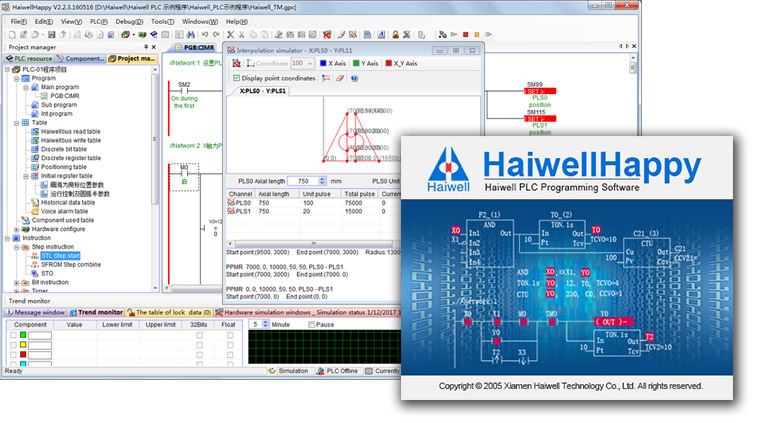 HaiwellHappy is the programming software for Haiwell PLC. It accordance with IEC 61131-3 standard, supports built-in simulator and three kinds of programming languages (LD-Ladder Diagram, FBD-Function Block Diagram and IL-Instruction List). It can run on the systems of Windows 98, Windows 200X, Windows XP and the later Windows versions. 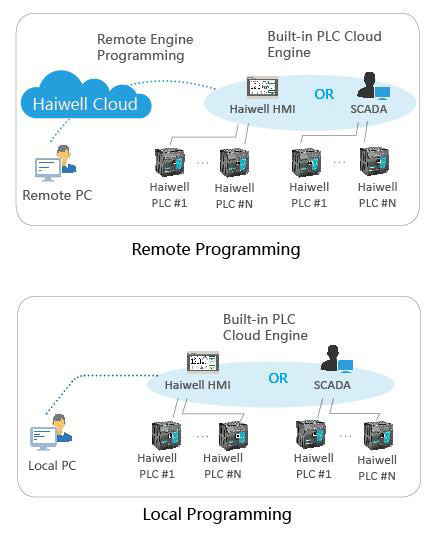 Support Haiwell Cloud platform, can use Haiwell cloud to do remote programming for Haiwell PLC as upload/download, firmware upgrading, self-diagnosis, monitoring and debugging. Easy for remote connection and real-time data monitoring of the site. Also you can do local programming through a HMI which supports built-in cloud engine. Haiwell PLC programming software supports internal simulator, realizing the PLC program run in the simulation. During programming or the programming is completed, you can run PLC program in the simulation without online to check the program execution is correct or not. It can reduce on-site commissioning time greatly, reduce debugging difficult and improve debugging efficiency. It is used to the debug communication instruction simulation tools. It can be manually input simulately response message returned from salve, or you can use the computer's serial port to communicate with salve really, Simulate the process that PLC executes communication instruction really and process the return data from the salve. Track and draw the trajectory generated from motion control instructions such as the linear interpolation, circular interpolation, listing parameters of the pulse output channel of the motive plane and corresponding to each axis, display the current position of the channel, the mechanical home position, output mode, you can set shaft length, unit pulses. PLC program can be generated to executable file which is released and executed independently. So you do not need to send the PLC program to the user, it can be very easy, very safe to put the PLC excutable file to the user to download, but do not worry the user would can see the program content. On the basis of analysis and absorption of various PLC instruction, Haiwell PLC launched many powerful innovations facilitate instruction. As communication instruction (COMM, MODR, MODW, HWRD, HWWR), data portfolio diversification instruction (BUNB, BUNW, WUNW, BDIB, WDIB, WDIW), PID control (PID), valve control (VC), upper and lower alarm (HAL, LAL), range transmitter (SC), temperature curve (TTC) etc. Any one instruction can realize the function but other PLC required to multiple instructions. These instructions are very easy to understand and use, greatly improve the programming efficiency and running speed. Create 63 blocks total (main program, sub program, interrupt program) and chose any programming language to program. The execution order of block can be adjusted at random. Each block can be imported and exported independently and has the same password protected of program projects. So we can fully realize the modular programming and program reuse dreams. Provides multiple instruction tables. Use these tables can reduce the amount of programs, saving program space, such as initialization data. Each table can be imported and exported independently and has the same password protection of program project. Search out all the PLC that connect with the PC. Show running status, fault status, RUN / STOP switch position, hardware configuration information, communication port parameters such detailed information of all the online PLC. Select any PLC for online monitoring, program download, firmware upgrade, controlling PLC stop, adjusting PLC real-time clock, modifying password protection, modifying communication port parameters, modifying the watching-dog time and PLC station names. Provide 10 pages of component’s monitoring table. It can choose in decimal, hexadecimal, binary, floating point and character to display data. Support component and register component monitoring hybridly and displaying component annotation at the same time. All instruction tables can be imported to the monitoring table. Monitor any of the register elements of its real-time curve, convenient to control and debug during the process. Provide shortcuts, drag and drop, click and many other command input. Suggest effective components or range of values for each input and output terminals. It can be entered directly. Some data of combination (such as communication protocols etc.) can also double-click the instruction to configure the input data. Provide the component comment, network comment, instruction comment, block comment, table comment, and project comment. After the component with “//” to input comments directly (e g.: X0 // motor start).Comments can choose to download to the PLC for reading or modification facilitately. Provide PLC resource window, instruction window, etc. All the instructions and detailed description of hardware modules can be found in powerful online help system which is open through clicking F1 key in the programming interface to find the answer. Even if use HaiwellHappy programming software for the first time who can easily complete the preparation of control program. Support all conventional editing operations, searching and replacing, instruction up and down, network up and down, copying and pasting between program projects. l Hardware configuration, sub program parameter passing, local components, indirection, print, preview, debugging, CRC calculation, password protection, etc.